Caremail 1407103 Mailing Tube - 2" x 18"
Mailing tubes offer a one-piece, triangular design so no additional plastic endcaps are required. Tubes are shipped and stored flat to save both storage and shipping costs. Once assembled, flat panels are conveyor-friendly and can be scanned easily. 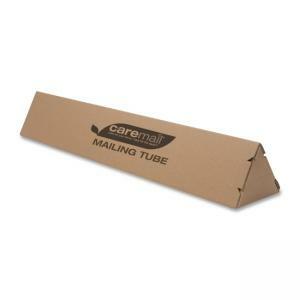 Mailing tube is made of 100 percent total recycled material and is recyclable with mixed corrugate.